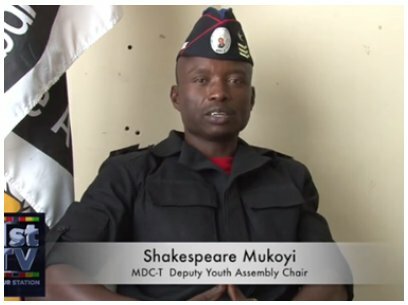 THE Dr Thokozani Khupe-led MDC-T is planning to subpoena the commander of the so-called Vanguard youth militia, Mr Shakespeare Mukoyi, from the rival Mr Nelson Chamisa camp, to tell the court of the group’s plans to usurp power from the late opposition leader Mr Morgan Tsvangirai. This follows revelations by Mr Mukoyi, who is also MDC-T deputy youth national chairperson, in an interview with a private newspaper published yesterday, that he was approached by Mr Chamisa’s allies while Mr Tsvangirai was still on his death bed to effect leadership change. He further claimed that the party leadership had blessed their activities that included the unleashing of violence on Dr Khupe and her allies. Dr Khupe’s deputy, Mr Obert Gutu yesterday said they have the Mr Chamisa-led outfit where they want them. “Since the Supreme Court said our case can go for trial, this is a good development for us. We have these guys where we want them to be,” he said. The two factions are involved in a court battle over legitimacy and the use of the MDC-T name and logo. Mr Gutu said his group feels vindicated in the wake of Mr Mukoyi’s revelations. “We have been saying this all along that Chamisa is illegitimate and we have been subjected to a barrage of attacks and insults with Dr Khupe actually being assaulted,” he said. In the wide ranging interview, Mr Mukoyi said: “During the time when Tsvangirai was on his deathbed, my brother (Charlton) Hwende and other leaders approached me saying the situation was bad and the party needed new leadership. “They told me that the work that they were about to do had to be done by the youth assembly, especially the Vanguard, which they are now dismissing as thugs today. We fought to bring sanity in the party until we had this hierarchy that we are having today. Mr Mukoyi is enmeshed in a messy fight for the right to represent Kuwadzana East constituency in the forthcoming parliamentary elections with MDC-T deputy Treasurer, Mr Hwende. Primary elections in the constituency were aborted over the weekend after both candidates made counter claims of violence and intimidation against each other.